I don't know where it came from, this this sudden, urgent urge to shop for aprons . I recall Mom sometimes tying a pretty gathered half apron around her waist if she was prepping for a party, but it's not really something that's buried deep in my psyche. 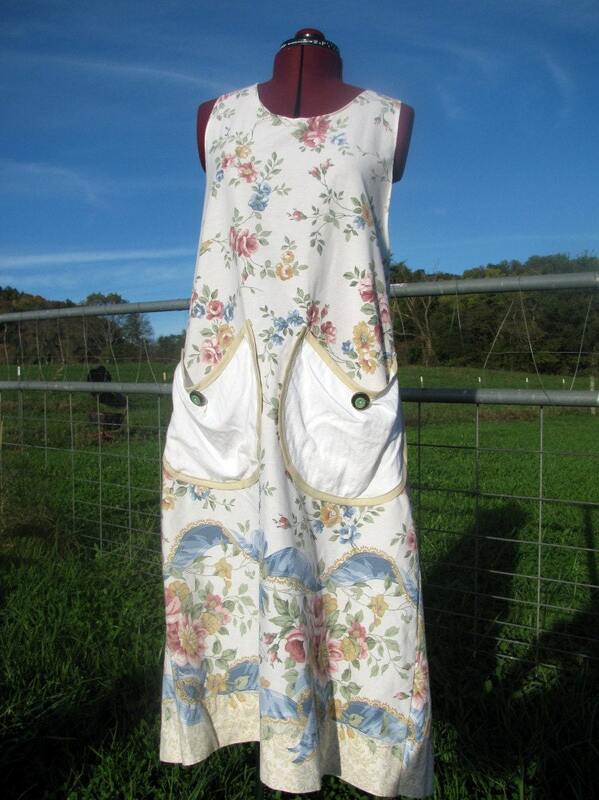 I don't recall grandmothers' aprons of any sort, but those are the ones I'm in search of today. The big crisscross kind you drop over your head, with lots of clothing coverage and big pockets. Maybe reversible. Certainly out of a beautiful fabric that's both washable and not too froufrou. Something like Auntie Em would wear, but with an edge, you know? I am a messy cook, and I'm cooking a lot more these days, as the weather cools and food is part of the warmth and comfort that coaxes us through the winter months. A messy cook with a limited RV size wardrobe needs to cover up when the olive oil starts to splatter. 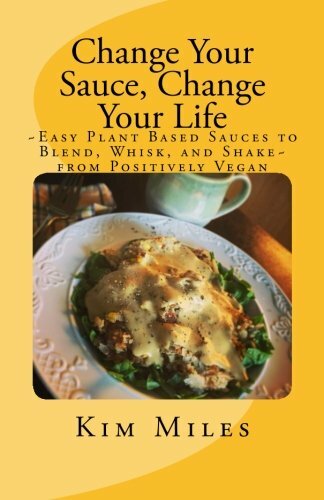 I don't have a big closet full of changes, or a washing machine to toss a favorite top into if I should goop it up with red chile or bubbling polenta. I need an apron. That's all there is to it. I tend to think of aprons as homely, frumpy, and utilitarian. They certainly can be that. But what I'm also finding "out there" are some good examples of how style and function can become friends. 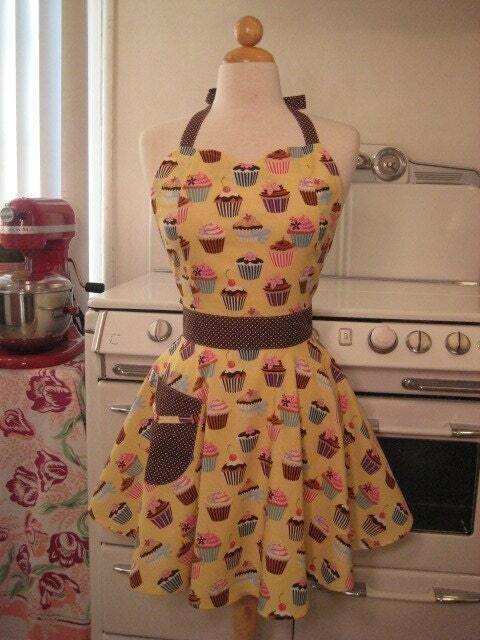 And because I'm thinking about aprons, of course they're popping up everywhere. This morning at breakfast, the waitress was wearing the very cutest apron ever. It was a tiny cocktail waitress sort of thing, tied low on her hips, with big pockets across the front, long ties in the back, and it was made of--get this--shiny gold faux leather with two little turquoise stone buttons for trim. OhDearGod, what a darling thing. It's not at all what I need, but I did take the time to ooh and ahh over it, and promised myself that one way or another, I will find my apron. 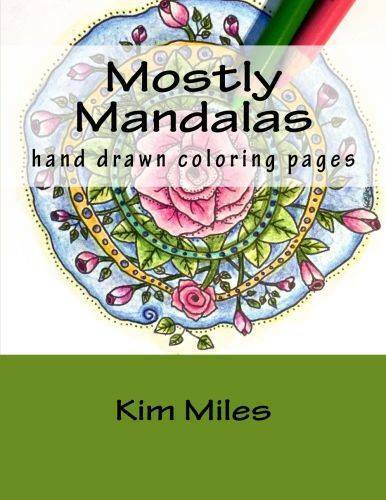 I've been searching Etsy, and coming close. I don't care for the kind that have a strap around the back of my neck. The strap hurts me. Something about the way it weighs on my neck. But there are some super cute ones out there, and in case they're what you're looking for, I'll share a few here. This would be my favorite so far. I love the skully fabric. So perfect for October, and for New Mexico any time of year. You can get this one from Cococtions on Etsy. 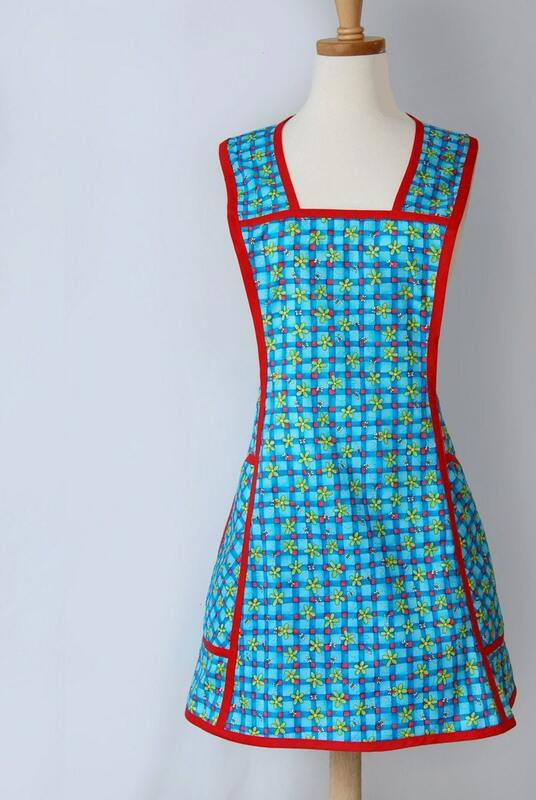 A search for "retro aprons" turned up these next two from Boojiboo, also on Etsy. (The Pink Poodles are for you, Mitzi!) I love them. I really do. But I still hope to find one as nifty as these, without the neck strap. 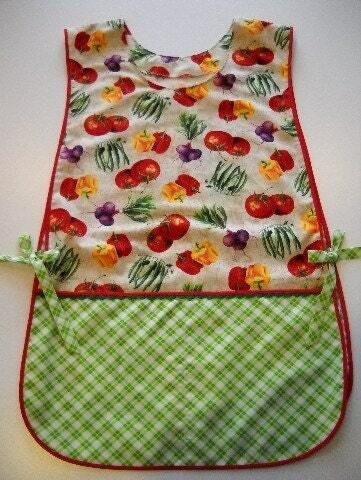 Widening the Etsy search to "farm aprons", "canning aprons", and "grandma aprons" brought up the next bunch. 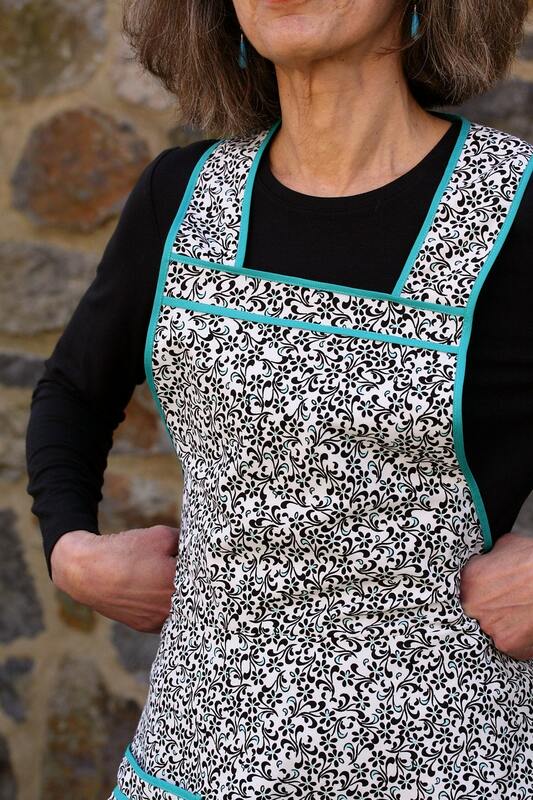 This canning apron from MollyGrimsMom has the coverage I'm after, but I'd like it longer, and the fabric doesn't really do it for me. This one from CreativeChics is in the running. No neck strap. Big pockets. A bit bright for my tastes, but it would do the job and also be the most colorful thing in my wardrobe. This crisscross "pinafore" from SummerFieldFarm is close. Very close. But I am not a "medium sized farm girl", and I don't want my apron to squeeze me in any way... If we could do a larger version of this in the skully fabric, then we'd really be talkin'. And so, after hours and hours of hunting for the perfect apron, I start to think, Hey, I have a sewing machine... and a new search begins. I mean, why not make what I want, out of the fabric I want? Everything I'm finding out there it so cute. I appreciate cute, but I don't really want to wear it. I found two sites I particularly like for vintage-style patterns. One is ModestHandMaidens. And the other is CandleOnTheHill. I'm not much of a seamstress, but I do have a bit of time on my hands these days, and how hard could it be to make this one? Imagine it in some edgy fabric, or even made from a recycled French table cloth or a soft India bedspread. See where I'm heading? And while this one is very sugary in pink, if I'm feeling confident and adventurous about my sewing skills, I think it would be pretty great with maybe skullies on one side, and red chile peppers on the other. Or how about basic black reversing to purple tie-dye? If I'm honest with myself, I really don't love to sew, so finding something ready-made would be better. Still, if I really get into this Apron Project, who knows? Maybe there's a market for non-cute aprons. And I wonder what my friends and family would think if I stopped giving them beads for their birthdays, and started giving them aprons instead... My head is spinning! Oh, the possibilities! Update! 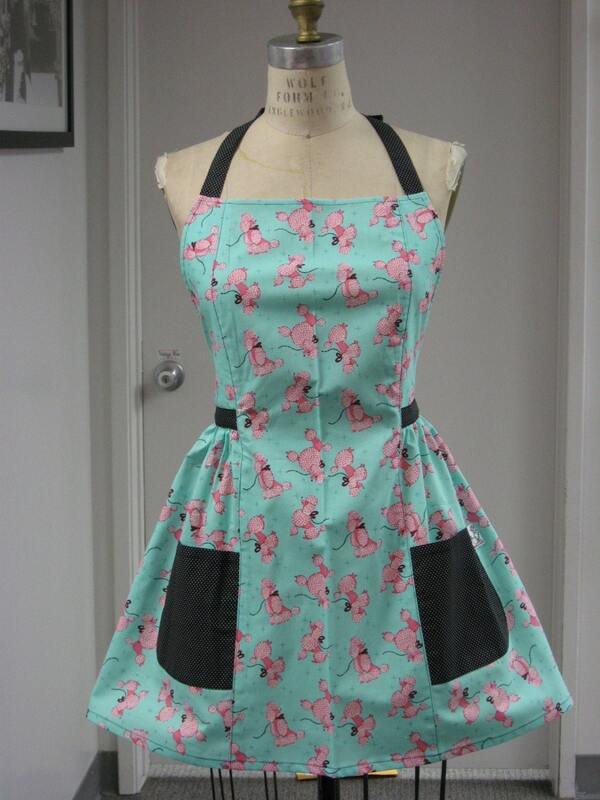 Cococtions is going to make me a pinafore style apron, as shown below, in the SKULLY fabric! I'm very pleased! 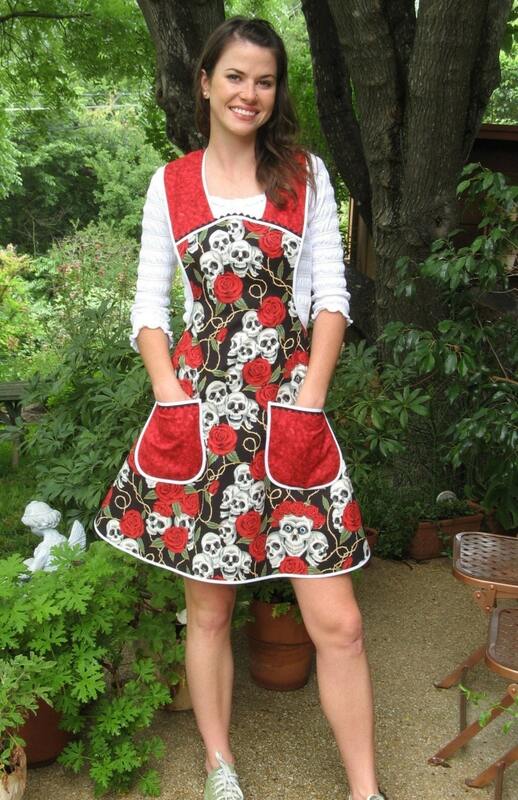 But before I found this out, I found another Etsy seller who makes dandy aprons, so I ordered this terrific red and black number, with its festive "bone heads". Get one for yourself at Momo's Retro Fashions. You are such a good writer Kim! Maybe one day I'll want an apron too. Somehow I think that your clothes must be much nicer than my three pairs of jeans and fifteen t-shirtlike shirts. And Debbie - Nice to know I'm not the only one. Hope you find some nice new aprons too! Kim, you're on to something!!! Why not put the same care and fashion into our aprons as our clothes!!! I may even cook some more!!!! Both give great coverage of our dresses, a nessessity when cooking and doing housework.